I don’t know about you but when I am in the woods I want to build a fire, cook over an open flame, and taste some char on my food. It just feels right. And natural. Sure, I own a few fancy stoves. Some ultralights that boil water in a nanosecond and some huge beasts that cook dinner for the whole campground on six burners. But that’s not really outdoor living. This bushcraft stove review is about finding a tool that fits the woodsman mentality. That is designed to make living in nature a long-term venture. A stove that really gets what bushcrafting is all about. I like to thrive in the wilderness. I set up shop like I am going to be there awhile. And I want to be self-contained. I don’t want to rely on anything that has to be replenished occasionally. No ice, no lighters, and definitely no stove fuel. For me, a bushcraft stove needs to burn wood. If it also burns pellets and paper that’s fine, but wood is the fuel I can find, process, and store so wood is what this stove needs to burn. Weighs less than 11.3 oz. The Emberlit Stainless Steel Stove burns wood, and it burns wood well. This stove is solidly constructed, folds flat for portability, and is designed to handle all your cooking needs in the great outdoors. In a nutshell, the Emberlit is a real bushcraft stove. If you’re in the market for a legitimate cooking solution for camping, backpacking, or to stick in your bug out bag you should take a close look at the Emberlit. Chances are you are really going to like it. I know I do. Each of the metal pieces is covered with protective tape. I am assuming this precaution is taken to prevent scratching while being jostled during shipping. I am not a fan of tape but it seems to come off easily enough. 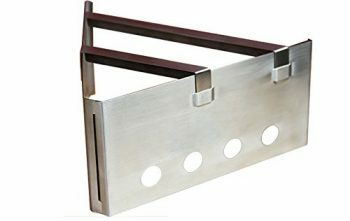 The product is made from stamped metal so it is possible some sharp edges will be left over from manufacturing. At least one unboxing reviewer suffered a small but bloody cut while handling the side pieces so be careful. Besides the tape there is no protection built into the product packaging. Of course, the unassembled stove is comprised of flat metal pieces stacked on top of each other so possible damage is limited. Still, after seeing the condition of other packages upon arrival I would like to see a little more thought to cushioning the product while in transit. This stove needs to fit together snugly and a bent piece will make assembly difficult if not impossible. I should note that none of the unboxing videos or product reviews I have seen mention shipping damage so perhaps the packaging is up to the job. I do give the manufacturer credit for staying away from a hard plastic case. Those are a nightmare to open. The entire Emberlit Stainless Steel Stove consists of seven pieces of flat metal. The 304 stainless steel is good quality and is thin enough to be lightweight but is not flimsy. The stove itself relies on geometry for stability. Once assembled, the four interlocking sides are tied into the bottom, or base, to create a very sturdy structure. On its own the box is structurally sound. Adding the two stove supports in an x pattern across the top opening make the stove rock solid. Emberlit is so confident in the durability of their stove they sell it with a lifetime warranty. That’s right, lifetime. I am guessing that is due to the stainless steel’s ability to resist corrosion and the simple design. Really, there are no moving parts to fail and no other material than the steel to erode with exposure to the weather. Emberlit says it will last forever and nothing I have seen or read disputes them. Beyond sheer ruggedness, Emberlit has incorporated a few great design elements into their little wood burner. They claim to be able to boil water in just ten minutes. On a wood burning stove that kind of heat output requires serious airflow. Emberlit has created a series of ample air holes in the side pieces of the stove for this purpose. The top is wide open to further increase draw. The Emberlit will burn a lot of fuel, but it will make heat. That is for sure. Emberlit includes a disclaimer about warping issues with the stove. Basically, over time the pieces will warp due to the heat. The manufacturer clearly states that this will not impact the performance of the stove and is to be expected. The carrying case is nothing fancy but it will get the job done. The stove fits nicely inside the Cordura material and the snap closure will keep it from sliding out. I give credit to Emberlit for thinking like a bushcrafter when choosing the color. The carrying case is high-visibility orange, making it a useful signaling device in case of emergency. The Emberlit is made for carrying with you. The entire stove folds down to 6 x 5.5 x 4 inches and is less than an inch thick. That is really small. Even the most diminutive of fuel cell stoves is significantly larger. Plus, the square profile is perfect for slipping in a pocket or down the side of a stuffed back. This stove will fit anywhere. At only 12 ounces this is a lightweight product. Most of the weight savings are due to the lack of fuel being carried with the unit. For an overnight trip, you might use one container of fuel in a conventional backpacking stove. But for a week long trek not having to carry 5 or 6 containers will really add up in your total pack weight. For this reason, the Emberlit would be my choice for true ultralight hiking. Although billed as a wood burning stove, the correct term is bio-fuel burning. Not all wood burners can do this. Because of the design of the Emberlit, fires will burn hot enough to cook food with whatever fuel you can find. Pine needles, leaves, and twigs will all be sufficient to get your stove going. The included base is a great addition in case you want to use fuel tablets. The bottom plate will keep the fuel close to the cooking area and inside the stove. This is a useful option to have and Emberlit did a nice job of making their stove multifunctional. At first glance the Emberlit seems easy to assemble but if you are not a slot A tab B person you could get in trouble quickly. The carrying pouch comes with assembly directions marked clearly on the outside of the pocket. Rather than tiny words in list form, the instructions are basic pictures. Large images and easy to follow directions make assembly quick and easy. The pieces are thoughtfully made with oversized tabs and slots. There is nothing more frustrating than wrestling with an item that requires a perfect, and only perfect, fit. The Emberlit allows for some wiggle room. Even someone unfamiliar with the product can usually complete full assembly in a minute or two. Of course, a high number of reviewers have forgotten the bottom plate on their first try. That is normally when they turn to the directions. Priced at approx. $34.95, the Emberlit Stainless Steel Stove is mid-range when compared with similar products. I found this surprising for two reasons. The first is the lifetime warranty and the second is the product is made entirely in the U.S.A. Normally one of these will add a few dollars to the cost and adding both would land the stove in the higher price points for wood burning stoves. Somehow, Emberlit managed to keep their costs down and we, the consumers, win. Of course, price means nothing if the cost does not provide value. The Emberlit stove is highly reviewed and the ratings are overwhelmingly positive. 79% give it 5 stars and 94% fall in the 4 and 5-star range. That is about as good as it gets with customer satisfaction. I like the reviews because they are filled with accounts of actually cooking on the stove while in the woods. And apparently, it performs well. With the quality stainless steel construction, the sturdy design, the multi-functional carrying case, and the mid-level price tag the Emberlit is a good value for the money. The following are a few unique features which add to the performance of the product and set it apart from its closest competitors. Most wood stoves have a pot holder integrated into the design. This usually consists of two parallel bars. The Emberlit’s X design is superior in that it adds strength to the unit and more securely holds cooking vessels of all sizes. Emberlit designed their stove with function in mind. The stove burns hot and consumes a lot of fuel. No one wants to be feeding twigs through a small hole in the side of a hot stainless steel stove. The oversize fuel port allows for small items to be tossed on the fire without risk of burns and is large enough for sizable branches to be fed through slowly over time. Emberlit has designed their stove with a solid bottom plate. This addition adds stability when assembled and provides a solid platform upon which to build a fire or rest a fuel tablet. The bottom plate keeps the fire off the ground, which is a huge benefit in damp conditions. At first glance the Bushbox Outdoor Pocket Stove is virtually identical to the Emberlit, and, at approx. $35.99, the pricing is close also. However, upon careful scrutiny subtle differences in design emerge. The Bushbox is definitely a box, made of spring stainless steel. It is German made and appears to be very sturdy. It assembles in much the same way as the Emberlit and includes a carrying pouch with shipping. The differences are in how Bushbox manages air flow and pot holding. First, the pot rack. Remember up above when I declared my love for the X-style Emberlit holders? Well, Bushbox went with the twin bar design. It may be functional for most uses but it won’t hold my steel mug. For air flow, Bushbox uses a perforated bottom plate and below that is an ash tray. This gives you an opportunity to clear ash while the fire is lit and could come in handy during longer burns. Overall, the Bushbox is well-made and constructed of quality materials. Packed flat it is smaller than the Emberlit by a full inch in every direction. This means a lot to me as I already thought the 6 inches was a bit on the cramped size for a cooking fire. 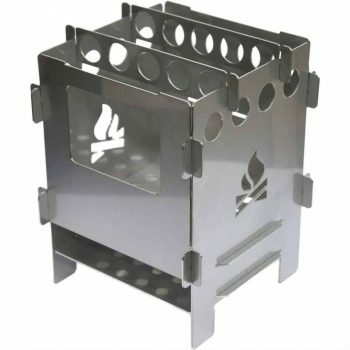 But if you are looking for an even smaller version of a foldable wood burning camp stove, the Bushbox is a solid product with excellent reviews. If you are into minimalism, this is the stove for you. It features an interesting design which has some advantages and maybe some drawbacks as well. The Foretrekker Outdoors Fold Flat Stove is actually an ultralight, coming in at only 6 ounces. This is not because they skimped on the material. It is light because they only use two walls and no bottom plate. It is an interesting design and allows for a much larger fire than the two box stoves on our list. Especially because the walls are 8 inches deep and 6 inches high. The Fold Flat solves a big problem for me. The box designs normally used in these stoves make starting a fire with a ferro rod and biofuel difficult because the firebox is pretty cramped. Foretrekker gives you all the room you could want to arrange a fat tinder bundle and spark away. Of course, if the ground is damp the lack of a bottom plate will give you other problems. For approx. $19.95, the Fold Flat Ultra-Light is not a high-risk purchase. I think of it as an advanced wind screen more than a stove. If you are looking to save a few bucks and are more interested in a sheltered campfire than an actual cook stove, the folks at Foretrekker have just what you need. The Bushbox Ultra-Light Outdoor Pocket Stove is the lightest on our list at only 3 ounces. To shave the weight the spring steel walls are very thin. Like 1.5 millimeter thin. And, there are only three walls. The ultra-light offers many of the same features as its larger and heavier big brother. Same ash collector, same perforated bottom plate and same dual bar pot holder. When assembled, it is sturdy and durable enough to be carried in a pack or tossed in the back of a pickup. To be realistic, Bushbox might have gone too light and too small for most cooking. While the larger box stoves could handle a cast iron skillet, this ultra-light model could not. The manufacturer lists one of its uses as a windscreen for fuel stoves. Another special feature is its ability to utilize multiple fuel sources other than biofuel. I love versatility but a bushcraft stove needs to be able to burn wood. At this size, I am not sure the efficiency would be there for serious cooking. Still, at only approx. $44.95, the Bushbox Ultra-Light Outdoor Pocket Stove is reasonably priced. For a serious solo light pack person saving the extra weight might make this stove worth the investment. The Emberlit Stainless Steel Stove is a real bushcraft tool. 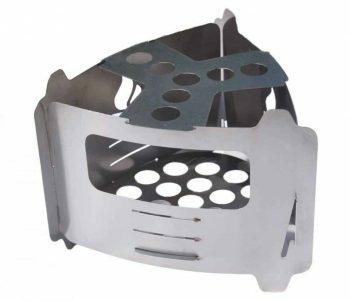 Perfect for hunting, camping, backpacking, and preparedness, this little stove makes the grade. If you are looking for a way to live off the land relying on natural fuel from your immediate area, the Emberlit will do the job. With a sturdy design and high quality stainless steel construction the Emberlit is built to last without rusting or bending. Every time you store it in the included pouch you can be sure it will emerge on your next trip ready to work. With the easy to read instructions printed right on the case you will have it assembled in minutes no matter how seldom it sees the light of day. The mid-level pricing and lifetime warranty make the Emberlit Stainless Steel Stove a good purchase, providing value and Made in America quality. You will appreciate the attention to detail shown in the design. The side wall air holes, solid floor, and X-frame pot rack combine to ensure your cooking needs are met. All in a small, easy to pack bundle. At only twelve ounces you might carry this in your bag for months without realizing it’s there. Of course, the high visibility orange pouch might give it away. Overall, if you are looking for a stove that can handle your rugged lifestyle and stays true to the nature of buschcrafting the Emberlit Stainless Steel Stove is a proven winner in the wood burning stove category. Small enough to carry but big enough to handle a real fire, the Emberlit is a solid choice for your backcountry cooking needs. We’ve come to the end of the review. We hope you have found a stove with the features that are important to you. Something a true bushcrafter can appreciate. In the wood burning pocket stove category I highly recommend the Emberlit Stainless Steel Stove. It is small and light enough to be very portable but its design makes cooking possible. Of the products reviewed, the Emberlit has the most features, all of which add to the function of the product. Stainless steel construction, quality airflow, and a lifetime warranty set this stove apart from its competitors. And, it’s made in America. The Emberlit Stainless Steel Stove is a good purchase at approx. 34.95. For a lifetime supply of cooking fires, that’s a good deal. Do you own an Emberlit Stainless Steel Stove? Do you have a favorite pocket wood burner you would like to recommend to us and our readers? If so leave your thoughts in the comment section. We would love to hear from you.